The deepest parts of the ocean aren’t easy to get to. They’re found in fissures in the seafloor, and the creatures there are strange – adapted to the dark, the cold, and the crushing pressure. But in those trenches, at hadopelagic depths greater than 7,000 metres (20,000 feet), our impact on this world has still been felt. For the first time, in the stomachs of scuttling creatures retrieved from six of the ocean’s deepest places, scientists have found plastic. A team of researchers from Newcastle University in the UK sent “landers” to the bottom of the sea in six hadopelagic trenches, across a broad range of sites: Japan, Izu-Bonin, Peru-Chile, New Hebrides, Kermadec, and the deepest known part of the ocean, the Challenger Deep in the Mariana Trench. Each of these landers is equipped with monitoring and sampling equipment; when they were pulled back to the surface, they had collected a variety of small marine creatures called amphipods for further study. Between the six trenches, they had collected 90 animals that they studied further, looking for plastic in the hindguts – towards the end of their digestive tracts – to rule out any recent ingestion, such as on the way up from the bottom of the ocean. They found plastic in the guts of 72 percent of the animals. That’s pretty bad. But it gets worse. The deeper they went, the more plastic they found. From the New Hebrides Trench, plastic was found in 50 percent of the amphipods. But from the Challenger Deep, at a depth of 10,890 metres (35,730 feet), 100 percent of the animals had plastic in their guts. “This study has shown that man-made microfibres are culminating and accumulating in an ecosystem inhabited by species we poorly understand, cannot observe experimentally and have failed to obtain baseline data for prior to contamination,” said marine scientist Alan Jamieson of Newcastle University in 2017, when he revealed the findings. Last year, a plastic bag was spotted in the Mariana Trench. Now Jamieson and his team have published the results of their study, showing that this is not an isolated incident. Our garbage is making its way to the bottom of the ocean globally, and we should all be ashamed. The plastic microparticles, on examination, were mostly semi-synthetic cellulosic fibres used in clothing. The team also found nylon, polyethylene, polyamide, and unidentified polyvinyls closely resembling polyvinyl alcohol or polyvinylchloride – PVA and PVC. And it’s likely that these once-pristine ocean trenches are the last stop for our trash. Once it’s there, there’s nowhere else for it to go. “It is intuitive that the ultimate sink for this debris, in whatever size, is the deep sea,” Jamieson said. “If you contaminate a river, it can be flushed clean. If you contaminate a coastline, it can be diluted by the tides. But, in the deepest point of the oceans, it just sits there. We don’t know what that means for the animals down there, but it may not be good. Ingestion of plastic rubbish is a known killer of sea turtles, and last year we saw multiple whales washed up onto shorelines, killed by plastic pollution. For amphipods, a gutful of indigestible plastic could affect buoyancy and mobility, making them more vulnerable to predators. And down in the trenches, where food is scarce, the disruption of one source of prey could have a devastating domino effect. It has impacts for research, too. Recent advances in technology have opened up hadopelagic exploration in unprecedented ways, and we’re finding all sorts of exciting new species, such as the Mariana snailfish discovered in 2017. But humanity has been wreaking plastic havoc for far too long. According to a study published in 2017, by 2015 over 8.3 billion metric tons of plastic had been produced by humans since the 1950s. Over 6.3 billion of those tons had been discarded – ending up in landfill or the natural environment. It’s hard to know exactly how much is making its way into the ocean, but a 2015 study found that the figure was up to 12.7 million metric tons in 2010 alone. So we have never seen the Mariana snailfish as it existed in an uncontaminated ocean. “We have no baseline to measure them against. There is no data about them in their pristine state,” Jamieson said. In the Bible, volcanoes and seismic activity are connected with God’s anger, especially in the context of the End of Days. Trouble bubbled up from the bowels of the earth last month as volcanic activity increased off the coast of Alaska. Bogoslof volcano, about 60 miles northwest of Dutch Harbor, erupted more than 37 times in the last three months, sending volcanic ash up to 30,000 feet. The eruptions are accompanied dramatically by violent lightning strikes.The volcano remains in a heightened state of unrest and could erupt again at any time. Fukushima Radiation Has Contaminated The Entire Pacific Ocean – And It’s Going To Get Worse. 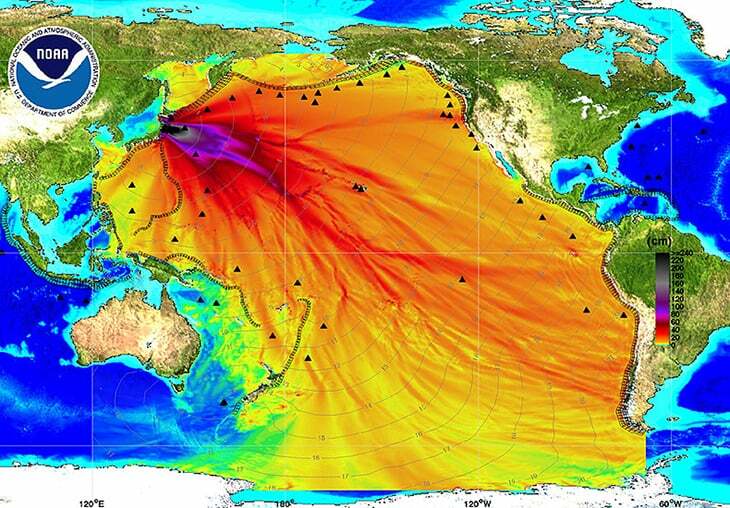 Fukushima Radiation Has Contaminated The Entire Pacific Ocean. 14. Atmospheric radiation from Fukushima reached the west coast of the United States within a few daysback in 2011. Massive Toxic Japanese Tsunami Island of Trash Headed Toward US. An enormous floating island of debris from Japan’s 2011 tsunami is drifting towards the coast of America, bringing with it over one million tons of junk that would cover an area the size of Texas. 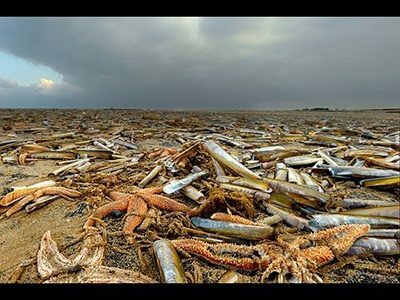 The most concentrated stretch – dubbed the “toxic monster” … – is currently around 1,700 miles off the coast, sitting between Hawaii and California, but several million tons of additional debris remains scattered across the Pacific. If the rubbish were to continue to fuse, the combined area of the floating junkyard would be greater than that of the United States, and could theoretically weigh up to five million tons. Even accounting for a bit of sensationalism in the projected size of the giant bobbing debris field, it is widely assumed that a significant percentage of the trash has essentially been soaked in radioactive water. In short, more radiation fallout from Fukushima is likely headed our way, and if so in gigantic fashion. 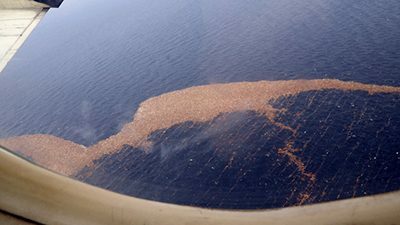 Some of the debris may have already crossed the [Pacific], however, with reports of Japanese fishing vessels washing up on the shores of Canada as long ago as winter 2011. If that proves to be the case, the levels of toxic junk already littering US beaches is likely to be high. This is the type of radiation whose long term impact is still unknown. But one can safely say, it is not something that improves the health of Mother Earth or the people who will come into contact with it. In this case, individuals on the West Coast of North America are potentially endangered by the breakdown of a nuclear power plant in Japan. When the corporate world talks about globalization, this is not the kind of interconnectedness that they want people to think about: a noxious undulating junkyard floating toward us. For Tepco and Japan’s Fukushima Daiichi nuclear plant, toxic water stymies cleanup. Two and a half years after a series of meltdowns, Japan’s effort to clean up what remains of the Fukushima Daiichi nuclear plant is turning into another kind of disaster. But many lawmakers and nuclear industry specialists say that Tepco is perpetuating the kinds of mistakes that led to the March 2011 meltdowns: underestimating the plant’s vulnerabilities, ignoring warnings from outsiders and neglecting to draw up plans for things that might go wrong. Those failures, they say, have led to the massive buildup and leaking of toxic water. “Tepco didn’t play enough of these what-if games,” said Dale Klein, a former chairman of the U.S. Nuclear Regulatory Commission, who recently joined a Tepco advisory panel. “They didn’t have enough of that questioning attitude” about their plans. The leaks into the ocean are far less toxic than the radioactive plumes that emanated from the plant after the earthquake and tsunami, forcing 160,000 people to move out of the vicinity. Thanks to that quick evacuation, experts say, there are no expectations of a Chernobyl-style spike in cancer cases — although the government is conducting thyroid checks of thousands of children. But the flow of contaminated water amounts to a slow-burning environmental disaster with implications for Japan’s wildlife and its food chain. The problems have prompted the central government to step in with about $500 million to fund new countermeasures, including a subterranean “ice wall” designed to keep groundwater from flowing into irradiated buildings. The latest government-led actions are particularly galling for some, who say Tepco should have taken similar measures earlier. One lawmaker, Sumio Mabuchi, who was also an adviser to then-Prime Minister Naoto Kan, says Tepco, deep in debt, neglected to take important steps against the groundwater two years ago because of concerns about its bottom line. Tepco’s president, Naomi Hirose, testified in parliament last month that the company hasn’t “scrimped” on the cleanup, though he did say that Tepco is “majorly at fault” for its failure to manage the groundwater buildup. The 40-year decommissioning is expected to cost 10 trillion yen, or about $100 billion — roughly two years’ worth of Tepco’s revenue — and the company says it is trying to save up and cut other costs. But for many Japanese, the company’s assurances inspire little confidence. Two members of Japan’s national legislature, speaking on the condition of anonymity to share what they describe as sensitive details, say Tepco continues to spend irresponsibly on lobbying politicians, offering them free trips to nuclear sites that include meals and lodging in hot springs resorts. A Tepco spokesman said the company does not offer such trips. 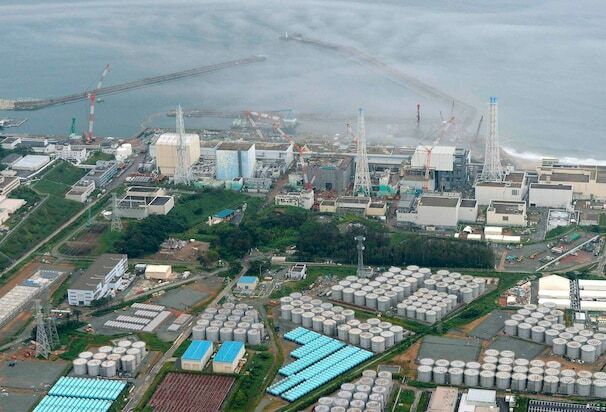 Japan’s crippled Fukushima nuclear plant has a new leak of radioactive water which may have entered the Pacific Ocean. The operator of the meltdown-plagued plant says at least 430 litres spilled when workers overfilled a storage tank that lacked a gauge that could have warned them of the danger. The amount is tiny compared to the untold thousands of tons of radioactive water that have leaked, much of it into the Pacific Ocean, since a massive earthquake and tsunami wrecked the plant in 2011. But the error is one of many the operator has committed as it struggles to manage a seemingly endless, tainted flow. Huge cluster of jellyfish forces one of the world’s largest nuclear reactors to shut down. Plant operator Tokyo Electric Power Co. said this morning that workers detected the water spilling from the top of one large tank when they were patrolling the site the night before. The tank is one of about 1,000 erected on the grounds around the plant to hold water used to cool the melted nuclear fuel in the broken reactors. Wrecked: This aerial view shows the Fukushima Daiichi Nuclear Power Station in 2011. 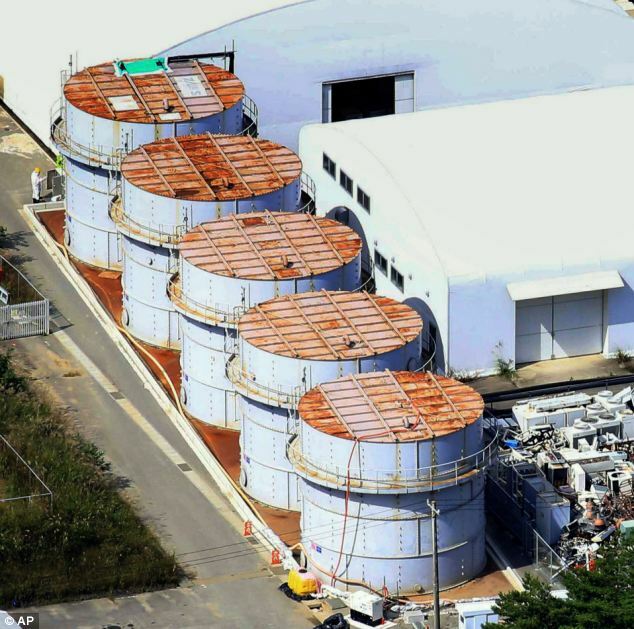 TEPCO said the water spilled out of a concrete barrier surrounding the tank and believed that most of it reached the sea via a ditch next to the river. The new leak is sure to add to public concern and criticism of TEPCO and the government for their handling of the nuclear crisis. In August, the utility reported a 300-ton leak from another storage tank, one of a string of leaks in recent months. That came after the utility acknowledged that contaminated groundwater was seeping into ocean at a rate of 300 tons a day. 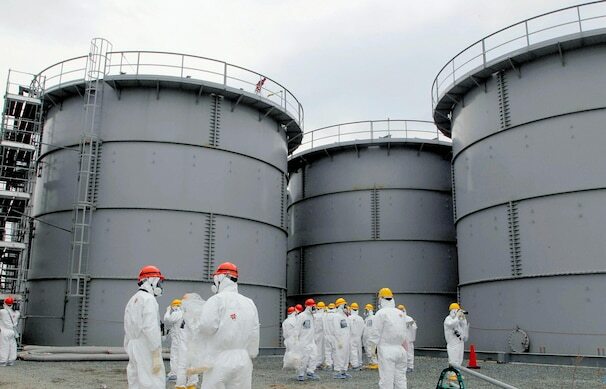 TEPCO spokesman Masayuki Ono told an urgent news conference Thursday that the overflow occurred at a tank without a water gauge and standing on an unlevel ground, slightly tilting toward the sea. The tank was already nearly full, but workers pumped in more contaminated water into it to maximize capacity as the plant was facing storage crunch. 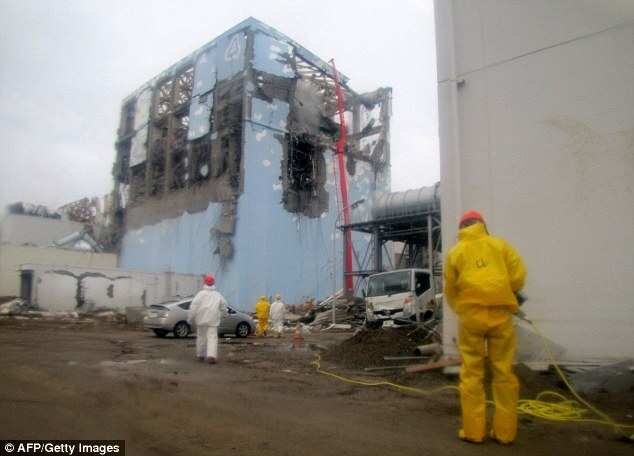 Dangerous: Workers spray water to cool down the spent nuclear fuel in the fourth reactor building at Fukushima in 2011. 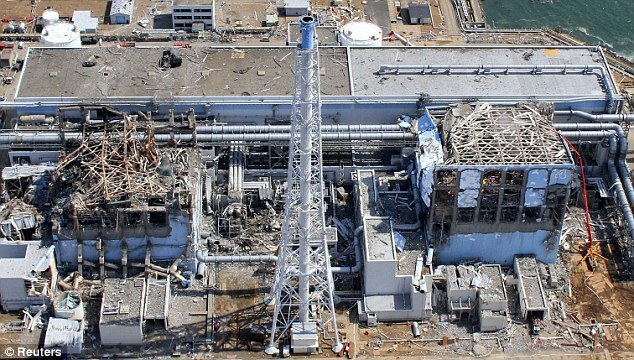 Experts have faulted TEPCO for sloppiness in its handling of the water management, including insufficient tank inspection records, lack of water gauges, as well as connecting hoses lying directly on the grass-covered ground. Until recently, only one worker was assigned to 500 tanks in a two-hour patrol. In recent meetings, regulators criticized TEPCO for even lacking basic skills to properly measure radioactivity in contaminated areas, and taking too long to find causes in case of problems. They also have criticized the one-foot (30-centimetre) high protective barriers around the tanks as being too low. The government has said it will spend $470 billion to build an underground ‘ice wall’ around the reactor and turbine buildings to block groundwater inflows and prevent potential leaks from spreading. It is also funding more advanced water treatment equipment to make the contaminated water clean enough to be eventually released into the sea. 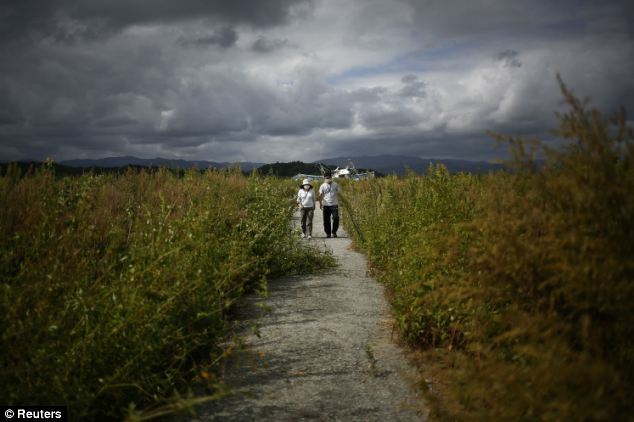 People wear face masks as they visit the cemetery at the tsunami destroyed coastal area of the evacuated town of Namie. FUKUSHIMA: RADIOACTIVE CESIUM LEVELS JUMP 9,000 PERCENT IN JUST THREE DAYS, NOBODY KNOWS WHY. 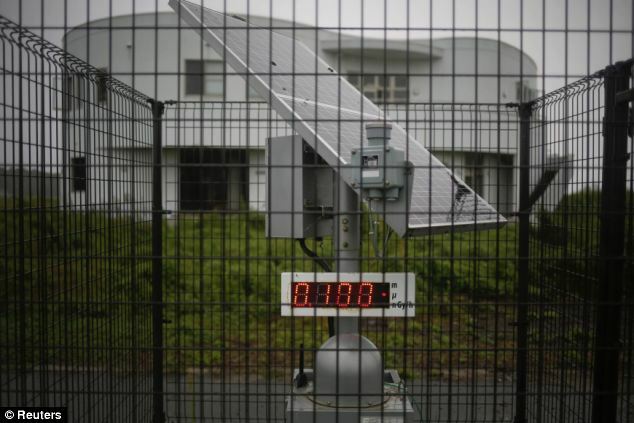 Some of the highest levels of ionizing radiation yet detected since the disaster first occurred were recently recorded at the Fukushima Daiichi nuclear power facility in Japan, according to shocking new reports. The Tokyo Electric Power Company (TEPCO), which runs the crippled nuclear plant, says levels of radioactive cesium in a water well were 9,000 percent higher on July 8, 2013, than they were three days earlier, and nobody knows why this is the case. The Asahi Shimbun reports that TEPCO observed the spike after testing water in a well on the seaward side of Fukushima’s No. 2 reactor. 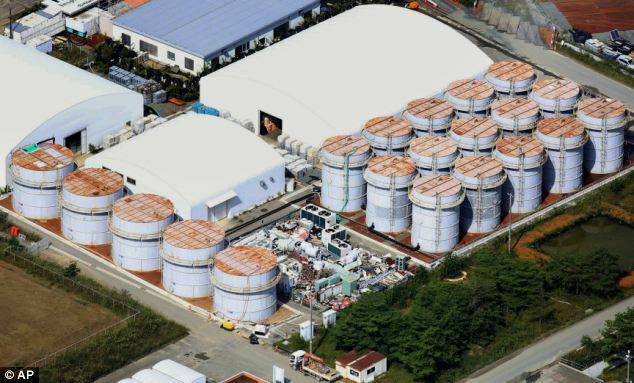 According to readings taken, radioactive cesium levels registered at an astounding 27,000 becquerels per liter (Bq/l), which is the highest ever since March 11, 2011, when the tsunami and earthquake first struck the plant. At this point, the cause of the spike is still unknown. As you may recall, radioactive water from the No. 2 well was found to have been leaking about a month after the disaster struck in April 2011. At that time, about 9,000 Bq/l of cesium-134 and 18,000 Bq/l of cesium-137 were detected in water samples. These amounts are 150 and 200 times higher, respectively, than the maximum level legally permitted. At the same time, levels of other harmful forms of radiation, including strontium, have remained oddly consistent, which has many officials scratching their heads. According to the most recent data, radioactive strontium levels remained mostly steady around 890,000 Bq/l both before and after the CESIUM spike. “We do not know why only cesium levels have risen,” added the TEPCO official. Besides cesium, radioactive tritium has also been detected in significantly higher amounts near the No. 2 well. According to The Wall Street Journal (WSJ), tritium levels in groundwater near the reactor have jumped 17-fold since December, and are continuing to rise with each passing day. Since May, tritium levels have increased a staggering 20 percent. What this all suggests, of course, is that the FUKUSHIMA disaster is far from over, and may only be in the early stages of unleashing massive environmental destruction. Despite the fact that more than two years have passed since the disaster’s onset, the situation appears to be intensifying with no end in sight, which could lead to much more serious problems in the future. Meanwhile, as much as 93 billion becquerels of RADIOACTIVE substances are believed to still be pouring into the Pacific Ocean every single day as a result of the Fukushima disaster. Reports from back in March indicate that, since the disaster, a total of 16.1 trillion becquerels of just cesium-137 are believed to have leaked into seawater.